We are beyond thrilled to welcome Tula Pink to Appletree Quilting Center for a weekend of sewing, laughs, and camaraderie. On Friday evening, join us for a fun evening with Tula Pink! She is a fabric and pattern designer, author and amazing illustrator! Tula will share her latest creations, talk about her design process and answer all your questions. Make sure you bring along anything of Tula's you'd like signed! Just in time for the arrival of Pinkerville! 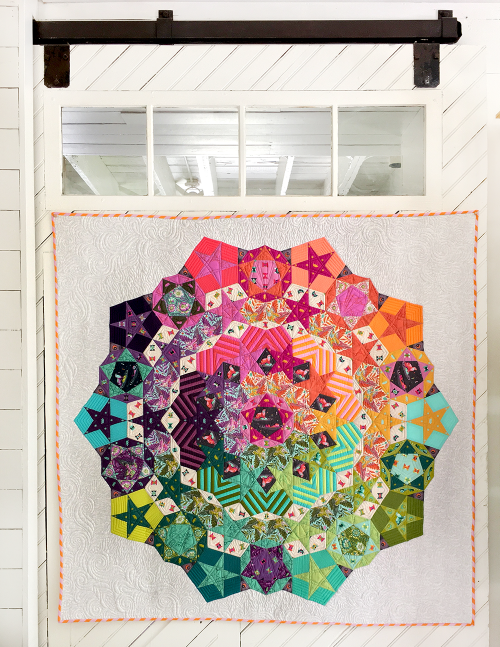 Saturday's workshop, Tula Pink will be teaching one of her favorite English Paper Piecing pattern, Tula Nova. Lunch is included. Sunday will be a Finish It Up party filled with fun demonstrations with our incredible staff and teachers. We anticipate the workshops will sell out quickly, as space is very limited. Registering now will hold your space in the class, and we will email project details and a materials list when more details are available. Tula now lives in a small mid-western town outside of Kansas City, MO in a house that used to be a barn and still sort of looks like one. Tula's main function in life is fabric design. She lives for it. Her signature designs have been adapted to fabrics, woven ribbons, paper products, needlepoint kits, embroidery patterns and sewing machines and can be found in independent fabric shops and retailers all over the world. Tula is most recognized in her industries for her dark sense of humor, a flair for hiding animals in the strangest of places (artistically, not literally) and her boldly unique use of color and pattern. Tula comes from the "more is more" school of design where there is never enough space and always room for that one last thing. Trunk Show only is $40. Trunk Show & Workshop is $450.